The goal for this day was to climb Wyman Mountain in the Dix Mountain Wilderness Area. This would be a second attempt. Last year, Leesa and I headed towards Wyman on 10/8/12, during the peak of leaf season. It was a beautiful day, but we started late, and we had chosen a steep route to the summit. By the time we got to "the igloo", a nice rock outcrop labeled 809 on the latest metric topo map it was about 1:30 PM. We decided to just enjoy some time on the igloo and save Wyman for another day. The walk along the herd path beside the Boquet River was a easy relaxing 35 minute walk. Once past the end of the herd path, the South Branch Boquet River turns northeast, and an unnamed tributary continues south west. I followed the unnamed tributary for a few minutes before turning due south to work my way up the slope to Clark Peak. Looking north from Clark Peak. From L to R, Noonmark, Round, Giant and Rocky Peak Ridge mountains. Rev and I stopped on Clark Peak to have a snack. I really enjoy the summit. 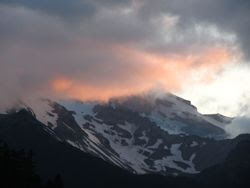 It is easy to get to, yet offers fine views in all directions. From Clark Peak, I worked my way SW, picking my way down the rock face. Rev and I crossed a dry brook, then Lindsey Brook (at a nice little 10 foot waterfall), before going up and over a bump labeled 602 (meters). We traversed part of the lower east slope of Wyman Mountain, before crossing another small unnamed brook. Shortly afterwards we reached an inviting ridgeline containing lots of open rock. We worked our way up the rock, which led us directly towards the" igloo" our 2nd stop for the day. a closer look at the "igloo"
We reached the igloo after enjoying the approach on the open rock. The igloo has a cleft in the rock on the west face which provides a means of gaining access to the top. We made our way to the top of the igloo and sat down out of the wind to eat some lunch. It had taken us 2.75 hours to walk the 4.5 miles from the car to the igloo. Now it was time to investigate Wyman Mountain. I knew the true summit was in the trees, but the south face offered fine views. Rev and I followed a bearing of 280 degrees and worked our way up the slope. We stayed just right of a ridgeline and occasionally stepped out on open rock to views of Macomb, South Dix (Carson) and East Dix ( Grace) as well as a view back down to the igloo. Once on the summit cone, we worked our way to the true summit through some moderately thick pines. No view from the true summit, just a small clearing. 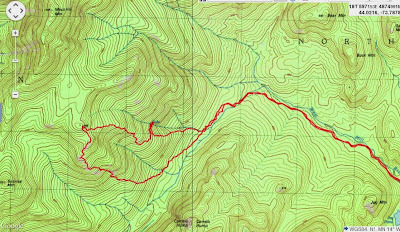 To return to the car, I had decided to try and take the Wyman ridge all the way back down to the unnamed brook, then back out on the South Branch Boquet River herd path. I was hoping that the ridge wasn't unbearably thick or full of blowdown. In fact, it was moderately thick, but varied, and I was able to scout and avoid small patches of thick growth. There were some welcome stretches of open rock along the way. As I got lower on the ridge I headed for the unnamed creek to follow it back to the herd path. This is where the going got more difficult. I came across lots of blowdown in the vicinity of the creek. I moved away from the creek hoping things would improve, but there were lots of trees down until I got within 15 minutes of the herd path. The weather had been partly sunny earlier, but became mostly cloudy for last couple hours of the hike. The herd path was a welcome sight, as I was tired of downed trees by that point. The walk out was pleasant. A successful trip was complete. 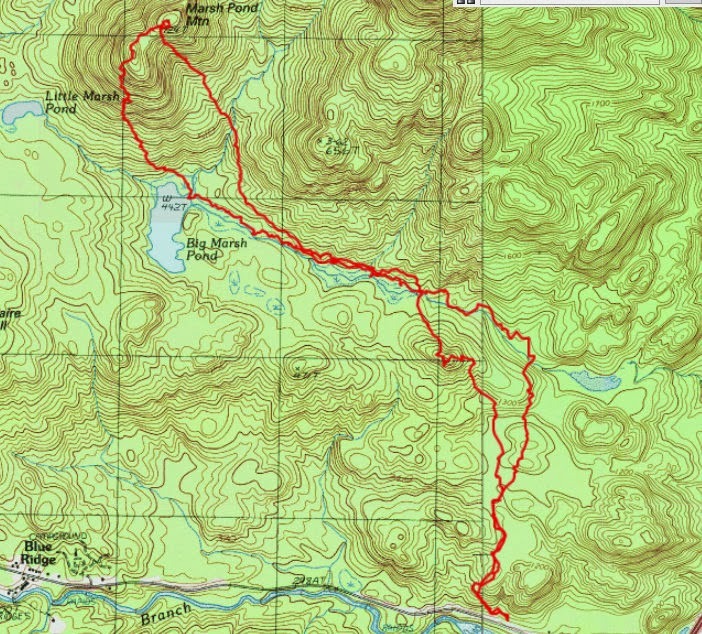 Since it is a holiday weekend, I chose today to do another bushwhack hike to avoid the crowded trailheads. Back on May 5th, I had climbed Camel's Hump Mountain in the Dix Mountain Wilder ness Area, and I had noted several things on that trip. There was a great looking waterfall across the Niagara Brook valley that came off of Macomb Mountain, and there was lots of open rock just below the SW shoulder of Macomb Mountain (just below the hill at 1066 meters). I decided to go look at both those things today. I parked at the West Mill Brook trailhead on Route 9 in North Hudson, NY. Since I didn't have a 4 wheel drive vehicle, I chose to walk the first 1.1 miles to the gate. From the gate, I followed the old West Mill Brook jeep road to the end, another 2.4 miles. The first 3.5 miles had been easy walking and I was at the end of the old road in just over an hour. From there, I crossed the brook and turned SE to follow the western side of West Mill Brook. The walking was easy on the lower slopes just above the brook. 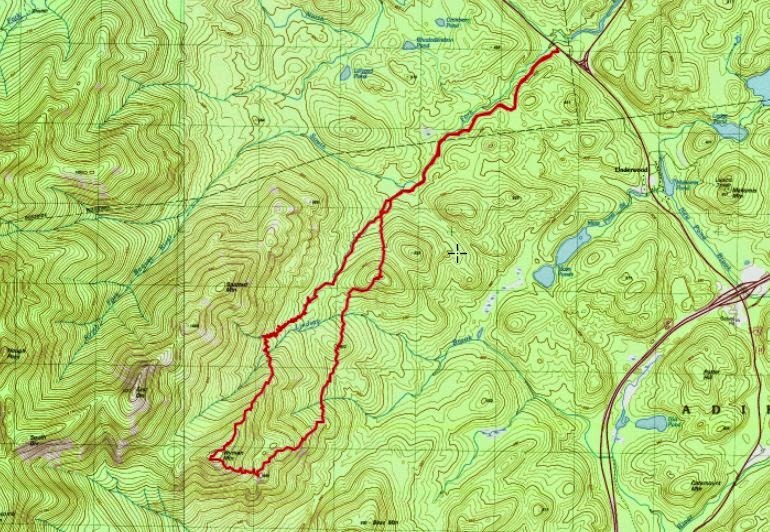 In looking at the topo map, the falls appeared to be about halfway up the slope to Hill 1066 (the SE shoulder of Macomb Mountain). I climbed the left side of the drainage. Soon a deep ravine developed in the drainage. I stayed high on the left. The bushwhacking became increasing difficult as I climbed. There was a lot of blowdown as I climbed the left side. When I decided I was in the vicinity of the falls, I cut across the slope in a northerly direction towards the drainage. I was quite lucky, in that, despite the blowdown, I managed to reach the drainage right at the waterfall. Perhaps the right side of the drainage is easier walking, but I chose the left after studying the contours on the map. I was hoping that there was still water flowing over the falls. Back in May when I observed the falls from Camel's Hump, there was quite a lot of water spilling over the rock. I was hoping it wasn't dry. I was in luck! What a spectacular waterfall. It is a two-tiered falls. The upper falls is the larger falls. It spills down onto a ledge where it flows a few feet north along the ledge and then spills over more rock, creating a second falls. It had taken me 1.5 hours to reach the falls once I left the end of the West Mill Brook trail and began to bushwhack. The falls is at about 2300'. There was still quite a bit of water coming over the falls, but the ledge was dry enough that I could walk out on it for an up close look. That may not be possible in the spring. The ledge is probably very wet during the spring runoff season, or after heavy rain. After I was done admiring the falls, I returned to the left side of the drainage and continued to climb the slope, heading for the Hill labeled as 1066 M (3550'). This is the SE shoulder of Macomb Mountain. I got to walk on lots of open rock, like the picture below while climbing towards Hill 1066. As I got to about 3100' the terrain switched to soft woods, and it got quite dense. There was a little open rock at the top, but views were limited. I reached the summit about 3.5 hours from when I left the car. I made my way down rather quickly since I had started the hike at 11, and it was now 3 PM. It was great to see such a fine waterfall and lots of open rock in the same day. I imagine very few people have seen this waterfall up close and it's worth the look. Maybe there is an easier way to get there.